Designed for use in the commercial or residential applications, retrofit applications with a screw-in Edison base adapter (included) for use in existing housings OR may be used in new construction with the LED dedicated Non-IC housing Series. The optical design provides superior cutoff, low glare and a projected LED life of 50,000 hours (20 years when used 6 hours a day). Installation Inst. The ML706830 HALO LED Module includes LED, driver, heat sink, torsion springs and Edison base adaptor. The HALO LED luminaire provides light output and distribution comparable to a 65 watt BR30 lamp, while consuming less than 15 watts of electricity. 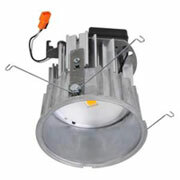 It provides excellent color rendering; a warm white color temperature, and produces over 600 productive lumens. The superior optical design also yields good cutoff and low-glare. It can be dimmed to 15% with most standard AC incandescent analog dimmers and is capable of dimming to 5% with select dimmers that have a low-end adjustment. This module can convert (retrofit) most HALO 6 Inch housing such as the H7ICAT, H7RICAT or H7T to LED. Or, if building is new construction, use this ML706830 module with the H750ICAT LED housing. You will also need a HALO LED trim for either application. Click on the model number below for pricing. To access contractor pricing please log-in. If you don't have an account with us sign up for one today!